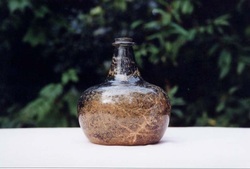 ﻿This bellarmine witch-bottle was discovered beneath the hearth in an old cottage in Felmersham, Bedfordshire in 2001. It contained hair, pins, and it tested positively for urine. Contents analysed by Dr Alan Massey. 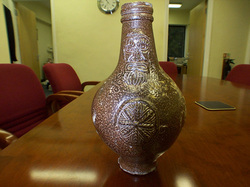 ﻿This bottle was found in Reigate, Surrey and is thought to have been deposited somewhere between 1700-1750. It was discovered corked containing liquid and nine bent pins in a disturbance adjacent to the chalk floor of a 17th century building being excavated in London Road. Dr Alan Massey published his analysis of the contents in ‘The Reigate Witch-Bottle’, Current Archaeology, no 169, 2000, pp34-6. The effort which went into concealing these bottles was large. How fearful of supernatural intrusion into your home would you have to be before you'd consider lifting your hearthstone, digging a hole and inserting a bottle filled with pins and urine? Brian Hoggard, 'Witch-Bottles: Their contents, contexts and uses', in Ronald Hutton, The Physical Evidence for Ritual Acts, Sorcery and Witchcraft in Christian Britain, 2015, Palgrave, pp91-105. Brian Hoggard, 'The archaeology of counter-witchcraft and popular magic', in Owen Davies & Willem de Blecourt, Beyond the Witch-Trials, 2004, Manchester University Press, pp167-186. Ralph Merrifield, ‘The Use of Bellarmines as Witch-Bottles’, Guildhall Miscellany, no 3, February 1954, offprint. Ralph Merrifield, The Archaeology of Ritual and Magic, 1987, Batsford, London.